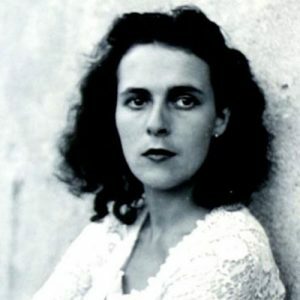 By the time that Leonora Carrington was in her mid-twenties, she had already established an impressive reputation as a Surrealist painter. Her paintings, peopled with creatures from some highly personalised mythology, often hybridised and ominous, were the mysterious visions of an artist who was blessed, and indeed cursed, with an incredible strength of imagination. It was this that grabbed the attention of many of the greatest proponents of Surrealism, among them her partner Max Ernst. Considering the short time that Ernst and Carrington were together, it is perhaps surprising that this remains one of the defining episodes of her life according to the art historical canon. Carrington met Ernst when she was twenty. A student under Amédée Ozenfant, she had recently been exposed to, and entranced by, the International Surrealist Exhibition in London. Carrington was the daughter of a wealthy industrialist who was loath to have his daughter involved with the avant garde. However, she had been rebellious since her youth. Her parents had eventually indulged her passion for art by allowing her to enrol at the Chelsea School of Art. From there, she had transferred to Ozenfant’s small academy, exposing her to the Purism and the rigorous interest in materials that infused his work. Yet it was Surrealism that had come as an epiphany to her. Carrington was introduced to Ernst at a dinner party arranged by Ursula Goldfinger, the wife of the architect Erno. Ernst was in London for an exhibition of his work being held at the Mayor Gallery. He was in his mid-forties, married and famous. He and Carrington felt an immediate affinity. Within a short time, her father discovered their liaison and tried to have Ernst arrested on the grounds of indecency in his pictures; this prompted the pair to go and stay with a group of Surrealists in Cornwall. They then went to Paris, where they lived for some time, Carrington becoming immersed in the heart of the Surrealist movement. There, her unique vision struck an immediate chord with André Breton and others, who advocated her work. Ernst and Carrington moved to the French countryside in 1939, enjoying a collaborative relationship. Guests would encounter Surrealism at the hands of their hostess—Carrington would sometimes sneak into their rooms at night, cutting locks of their hair that she would include in their omelettes the following day. However, this charmed Surreal idyll descended into chaos and tragedy with Ernst’s arrest, first at the hands of the French authorities as an enemy alien, and then after his release and the fall of France, with his incarceration by the Gestapo. Ernst managed to make his way to New York; Carrington herself escaped to Spain, where she had a breakdown. She spent some time being treated there, partly with shock therapy, an episode that would mark her for life. At Breton’s behest, she would write about this episode in her book, Down Below, first published in 1944. Eventually, Carrington’s father used his connections to send her nanny by submarine in order that she could be taken for treatment in South Africa. However, Carrington escaped her guardians and managed to reach the Mexican Embassy in Lisbon, having recalled that the poet Renato Leduc, an acquaintance she had met through Pablo Picasso, was based there. Leduc married Carrington in order to facilitate her travel to the United States, where she spent some time in New York before moving to Mexico. Her marriage to Leduc ended soon, and a few years later she met her second husband, the Hungarian-born photographer ‘Chiki’ Weisz. Living in Mexico, Carrington’s paintings continued to develop, taking a new impetus from her surroundings and from the local mythology. This fused with the Celtic lore, the occult and the other creatures and characters that peopled her paintings. Gradually, her reputation spread, and she became recognised both as a prominent Mexican artist and as one of the last of the Surrealists. During her decades in Mexico, she enjoyed friendships with people such as Luis Buñuel and Remedios Varo, and even attended the second marriage of Frida Kahlo and Diego Rivera. She was commissioned to paint a mural for the National Museum of Anthropology in Mexico City. The resulting work, The Magical World of the Mayas of 1963, combines themes that are Mexican, archaeological and personal, creating an intense, idiosyncratic and absorbing vision. Over the years, Carrington has been exhibited in monograph shows throughout the world, from London to Mexico City to New York to Tokyo. Her recent retrospective at Tate Liverpool in 2015 was particularly well received, re-establishing her as a major force of Surrealism.